The Chartered Institute of Logistics and Transport is announced Dato’ Ts Abd Radzak Abd Malek FCILT as International President Elect. Radzak will assume the presidency in January 2020. As International President, Radzak intends to focus on several key areas, including Young Professionals (YP), Women in Logistics and Transport (WiLAT), Regional Structures and Industrial Revolution 4.0 in Logistics and Supply Chain. Continuing the excellent work done by the current International President Kevin Byrne, Radzak is determined to keep YP at the heart of the CILT International agenda. In addition to awareness and outreach programmes intended to increase the profile of talented young professionals and a policy to ensure all branches have YP facing structures, Radzak will integrate its YP network with its career development tools, allowing tomorrow’s leaders to anchor the journey from member to chartered member and beyond. As a strong supporter of women in the workplace, Radzak will also focus on assisting the creation of WiLAT chapters in all CILT branches. In countries where there is no CILT presence, the neighbouring branches will be encouraged to support WiLAT-oriented activities, with the long-term view of establishing a full CILT and WiLAT presence. Furthermore, Radzak is keen to see growth in the number of WiLAT members. In addition to a number of outreach and awareness campaigns, he will put the support of the International Presidency behind a Members-Get-Members recruitment drive, to ensure it is reaching out to and representing all women working in the industry, at all levels and in all countries. In the spirit of stronger together, Radzak will seek to widen the CILT activities in all countries with established CILT offices and strengthen CILT in other affiliated member countries. He will also seek to strengthen its regional forums to encourage better understanding of the cultures, opportunities and challenges of different countries. Speaking about the appointment, former CILT International President Dr. Dorothy Chan backed Radzak to succeed. A member of CILT for 17 years, Radzak joined in 2001, rising to become President of CILT Malaysia in 2004, a role he continued until stepping down in 2008. In 2010, Radzak was re-elected as President of CILT Malaysia and in 2012, was appointed as International Vice-President for the Southeast Asia region. Born in Kampong Gunung Mesah Hilir, Gopeng, a village in the Perak state, Radzak started his 37-year career in logistics in 1972 as a Railway Station Master with Keretapi Tanah Melayu Berhad (KTMB), the Malaysian national rail carrier. After obtaining a BA (Hones) from the Malaysian Science University (USM), Radzak continued his journey with KTMB, culminating in his appointment as Managing Director in 2007. In addition to his professional work, Radzak currently holds positions on several boards including the Board of Advisors to the Malaysia Institute of Transport, Board of Industry Advisory Council of University Kuala Lumpur, board of the Malaysian Professional Centre, as well as his role as President of the Malaysian Services Providers’ Confederation. 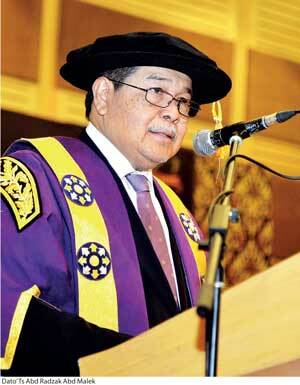 He was made Dato’ Paduka Mahkota Perak by the Ruler of Perak in 2009.